The ever-growing problem of disposing one-time plastic may have finally found a solution. 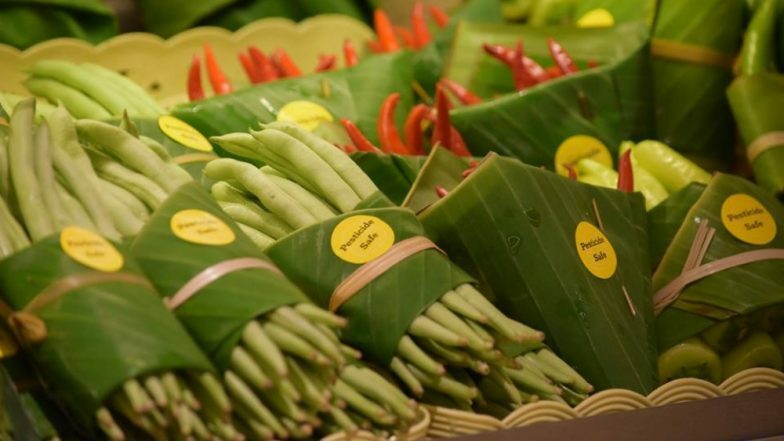 While governments around the world are struggling to dispose or recycle plastic, recently, Thailand's Rimping Supermarket started the use of banana leaves to wrap food items. The innovation usage has impressed social media users across the world who are now urging their leaders to encourage the use of organic packagings. According to Forbes, supermarkets in both Thailand and Vietnam have started the use of natural wrappers. Pictures of vegetables and fruits wrapped in banana leaves have gone viral on social media. Wrapped up in banana leaves, the veggies can be seen secured with a fibre thread or a tiny wooden stick. They also provide cloth bags which customers can use to carry the purchased items. The move received widespread positive reactions after a real estate company in Chiang Mai, Perfect Homes, posted photos of the banana leaf packaging to their Facebook page. Eliminate Single-Use Plastics! Boat Made of Plastic Collected From Kenyan Beaches Sets Out on Voyage to Spread Message. Reportedly, customers were delighted to see the supermarket adopting organic methods. One of the comments read, "Love the idea, Bangkok supermarket should adopt this idea too. Talking about the innovative method adopted by Thailand, Global Citizen says banana trees with leaves as big as nine feet are quite common and largely available in Thailand. The use of the organic material is a step towards zero waste movement. Some brands have also started the use of bags made from corn starch, cassava and algae. Meanwhile, this reminds us of how traditionally South India has always been using banana leaves for a long time. From serving food on the leaf to packing things in it, the method is quite popular there.